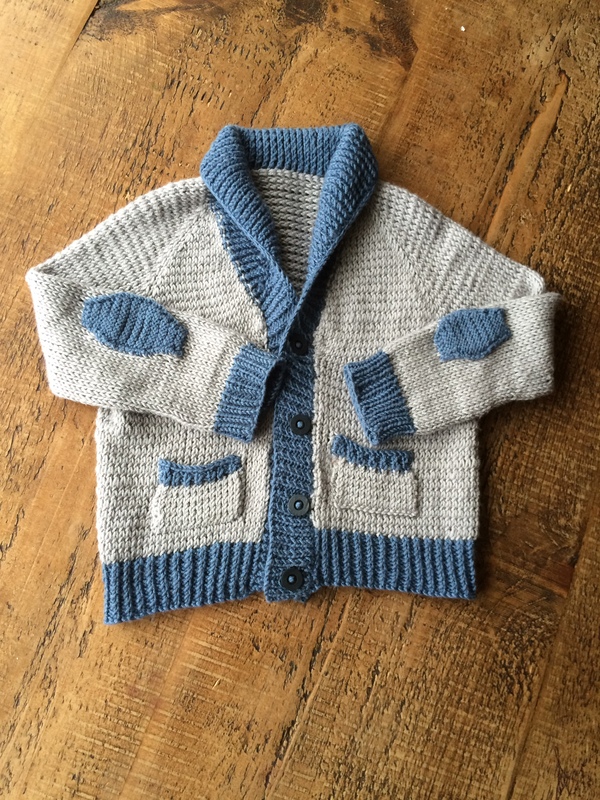 Georgie Pudding finally gets his ‘gramps’ cardigan! So here it is… Finally! 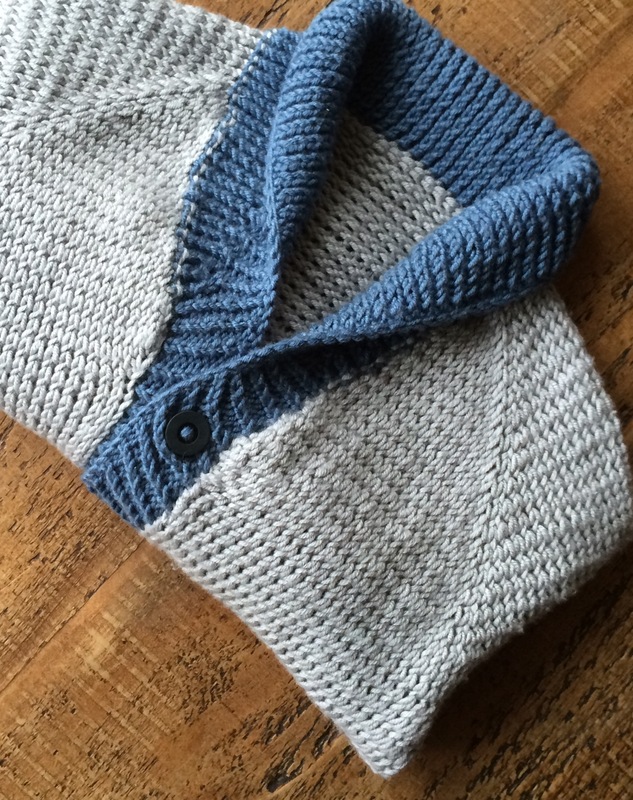 After months of snatched hours here and there I’ve finished ‘gramps’ cardigan from Tin Can Knits and I’m so happy to have completed it in time for the chilly months ahead. I switched the colour combination from brown and green, as shown in the pattern, to grey and blue as having a little blonde, blue-eyed man I thought this would suit him better. The collar was definitely the trickiest bit and despite being convinced half way round I had made a terrible error I was delighted when all turned out fine having correctly followed the instructions. Button bands are still something I need to work on, creating those little holes should be easy but I still haven’t accomplished a perfect finish on every one. But with the words ‘if on galloping horses’ ringing in my ears from my lovely mentors at ‘Knit with Jan’ I’m happy with this attempt. This was the first project I’ve ‘blocked’ and I’ve not done so in the past more out of impatience than anything else. Having done it now I will definitely be doing it going forward as the shaping and fit of the cardigan is much improved for it… even if having to wait for the cardigan to be dry seemed to take forever! As with ‘Pink Fish’ I used the gorgeously soft Debbie Bliss Baby Cashmerino and knitted the majority of the project on circular needles using a set of five Clover Bamboo 16cm needles for the sleeves. 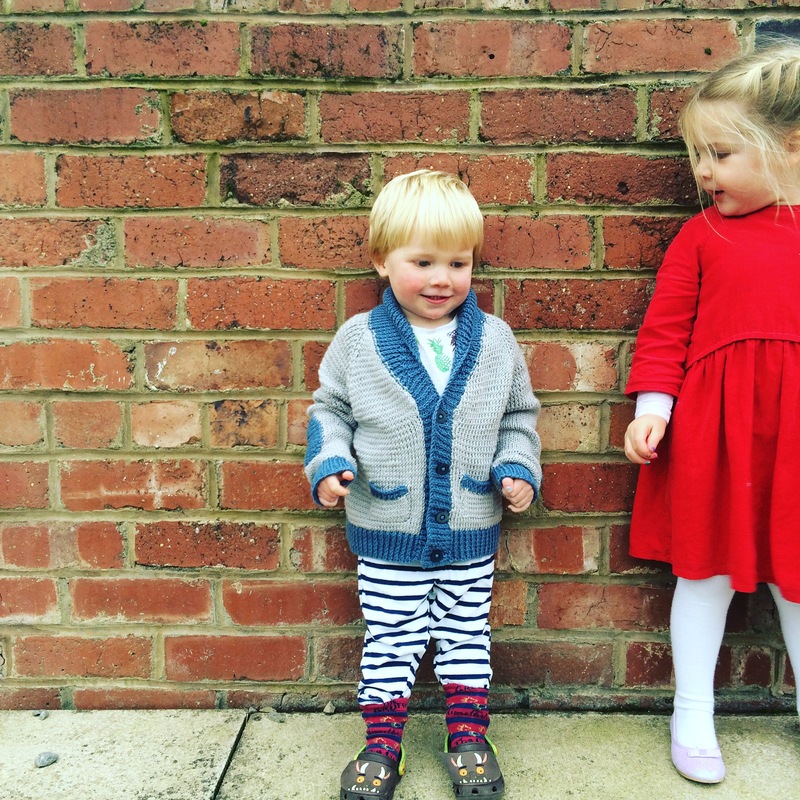 A crocheted dress is the next project, already under-way and hopefully won’t take quite as long as this cardigan. 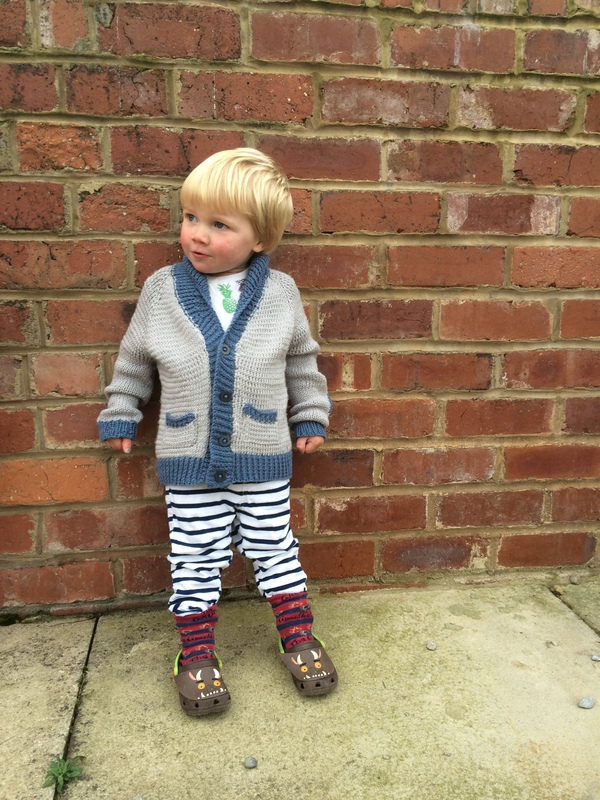 I can say that although the cardigan took a while to finish I’m so happy and proud to see Georgie Pudding sporting his very own hand-made cardigan and I can’t wait to make him some more! Over the coming weeks I’ll be attending The Luxury Crochet Retreat with the incredibly talented Frank&Olive and The Knitting and Stitching Show is coming to Harrogate at the end of November so that’s another exciting date in the diary. So lot’s of exciting things coming up and I’m always looking for new projects and materials so if you’d like to share your work with me please don’t hesitate to get in touch!